Hello again! I am so excited to get another postcard from you soon! How are you? My latest postcard is about a phrase that I live my life by. It's a phrase that my mother often uses when she doesn't have an answer or an explanation for one of my many questions! 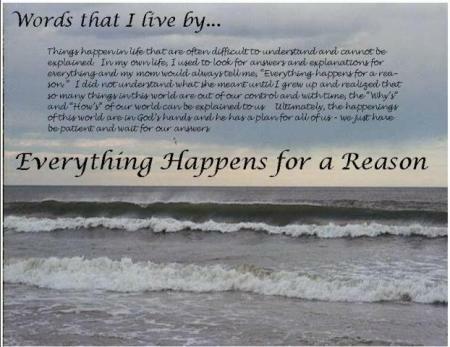 I believe it is important to remember that good things and bad things happen all the time in this world and we must keep in mind that God has a plan for all of us. When we cannot understand why certain things happen, especially sad or hurtful things, it helps me to believe that everything happens for a reason and only time will tell what those reasons are. It helps me make sense of all the confusing and often bad things that happen on a daily basis in life. I hope these words inspire you the way that they inspire me and I look forward to hearing about the words you live by!